I had no plans to go home for Christmas until the beginning of December. As Christmas neared, I developed a desire to head home. By now, getting a ticket was already a herculean task. While casually browsing for airfares for return after Christmas, I found a special flight from GoAir on an OTA Portal. I booked that flight for my return, and then began my hunt for tickets to go home. The same special flight was listed the other way - but was already selling at high fares. The bus fares from Bangalore to Kerala were way higher than corresponding airfares (pun intended). I checked for bus fares to Coimbatore instead, and found that KPN had lots of empty seats, all at regular fares. 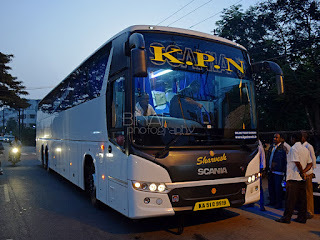 I used their app to book a ticket on the first night service out of Bangalore to Coimbatore. This service was recently upgraded to Scania Metrolink. I got a seat towards the rear half of the bus. My bus was scheduled to reach the pickup point at Bommanahalli, at 2230hrs. The bus leaves Kalasipalya only at 2200hrs - reaching the pickup point in 30 minutes sounded impossible. My brother dropped me at the pick-up point sometime around 2230hrs. KPN Travels has a huge waiting area along with their office in Bommanahalli - infact, they occupied most part of the first floor of the building. I checked with their office, only to get the standard "Bus will come now" reply. Sometime past 2235hrs, I got a message from KPN with the details of the bus. The message said I'd be traveling on KA-51-C-9919 - confirming the fact that it would be one of their brand new Scania Metrolink coaches. Looking at the buses that came for pick-up, I was sure there there would be a very heavy delay in my departure. There was a steady stream of departures from there. The waiting area never got empty - the number of passengers going out seemed to be equal to the number of passengers coming in new. I was standing all through the time. It was not just KPN, even the Parveen travels office downstairs seemed busy. My friend was waiting at Madiwala for a later bus of KPN, and he kept updating me about my departure. My bus had arrived at Madiwala sometime around 2345hrs - over an hour late already. My bus reached Madiwala sometime around 0005hrs - a good 1h35m late. They did not let in passengers till the dispatcher from office came to the bus. The bus was already 90% filled - a couple of passengers joined the bus at Bommanahalli. My co-passenger was already present. My seat was #R18 - a window seat on the right seat in the 9th row. The leg room seemed better than the other Scania's that I've been on - probably because KPN keep only 12 rows of seats, and reserves the last row for a driver berth. So the overall leg space is better. The bus got moving from Bommanahalli at 0011hrs - 1h41m late. The driver kept constant pace through the journey. Roads had freed up by now. The next pick-up point was Bommasandra - 0022hrs. I slept soon after we started from Bommasandra - a nice long sleep. I vaguely wokeup as we were leaving some toll gate near Perundurai - but continued sleeping afterwards. I got up again as the bus turned off the highway towards Coimbatore town. The driver switched on the night lamps first, followed by FM Radio. This woke up passengers - smart thought! The cabin lamps were switched off as near Hope College. A lot of passengers got off at Hope college (0608hrs). The cleaner went around calling passengers as we neared Gandhipuram. The bus stopped outside Gandhipuram bus station at 0619hrs - 49 minutes late. It was a no-nonsense journey. The AC was kept at comfortable temperatures. The bus, KA-51-C-9919, had about 32000kms on the odo. The interiors were clean and well kept. The driving was great - soft and stable. No hard brakes or honking through the night. I really liked the service. Entertainment: Available, FM played at morning. Will I take this service again? I like KPN. I'd take them again. 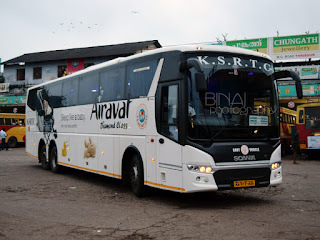 I had initially planned to take a private bus from Coimbatore to Thrissur - their regular bus seemed full, and had opened a special bus at a fairly high rate. I was unsure of the quality of bus, and kept the decision on hold. 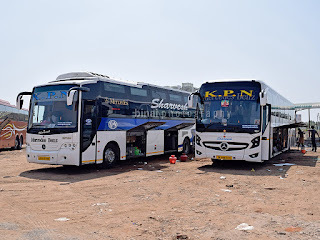 I first decided to check direct buses from Gandhipuram - there was humongous crowd at the bus station, I felt it was not a good idea to wait for a direct bus. 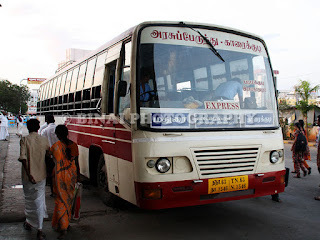 Hence, I took a TNSTC bus from Gandhipuram to Ukkadam. At Ukkadam, I got into a bus to Palakkad from there. The bus left immediately from there, and dropped me at Palakkad by 0759hrs. I took a tea break here, and then got into another bus from there at 0830, finally reaching Thrissur by 1000hrs. I got home by 1130hrs. In all, a journey that I enjoyed a lot. To Kochi, on a rare B737-700 of SpiceJet!